A few people have been asking me to do a review on the property mentorship company Positive Real Estate. Here is an objective review of who they are, what they do, the costs involved and who I believe there service is suitable for. 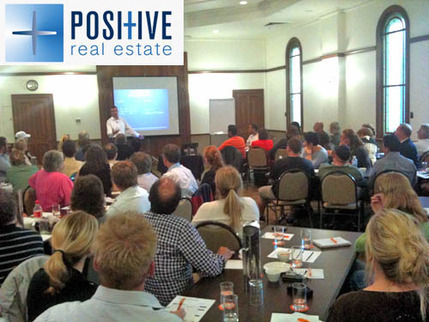 I have been fortunate enough to speak with some of the staff and mentors at Positive Real Estate to find out about what they do. Full disclosure: I have no affiliation with Positive Real Estate at the time of this writing (monetary or otherwise) and have not signed up for their program personally. I have tried to be as accurate as possible in my description of my business but I don’t know the inner workings of the business so that this information with a grain of salt. Comments from real customers are below (please leave yours if you have an experience) but I ask that you remember that happy customers are unlikely to leave comments on posts like this one so just remember that when reading people’s experiences. Positive Real Estates operates and exists through local mentors who are scattered all around the country. They have grown at a significant rate and have mentors in all major capital cities as well as all major regional centres as well. There is a one time fee for new members. This is one time fee is for both you and your spouse and gives you lifetime access to your property mentor. I really like the idea of having access to a property mentor for life, even though you only have to pay once. The mentors will then help you understand you property goals and teach you about investing. There are also members meet ups which are held approximately once per quarter where you can network with other people who have signed up for the program. The company also makes money through their mortgage brokering service as well as making money when you purchase one of their properties. I don’t believe any of this is bad. It makes little difference going through them as a mortgage broker vs another mortgage broker and they would be more inclined to help you than a traditional mortgage broker as you are already a member. The only caution I would have is doing careful external analysis if you are considering buying a property from them. On the forums people stated that they can make up to 6% on the purchase price of a home. So if you buy a $400,000 property through them they could potentially be making $24,000. I had a friend buy a property through a service similar to Positive Real Estate (not Positive Real Estate) and he didn’t get the capital gains growth he was promised. In fact he got little to no growth for over 5 years. One of the hardest things to find when considering investing in property is trying to find someone to encourage you along. Most friends and family tell you “Now is not a good time to investing”, or “Don’t invest there I heard from a friend of a friend of a friend’s cat that it’s a bad place”. This fear paralyses your and means you don’t ever take the plunge to invest. This fear is so big that I created an entire module in On Property Plus (my membership site where I find and list positive cash flow properties) dedicated to researching the area your property is in so you can be confident and not have this fear when friends say things to you. Positive Real Estate offer you a mentor who you can call whenever you want (being a mentor is their full time job) as well as a network of other investors in your local area who you can take out for lunch or hang out with whenever you want. What Are The Costs Involved In Joining Positive Real Estate? Costs change all the time. With the growth of their network creating more value for people who join mixed with inflation I would say that the price isn’t going to go down any time soon. The price to join isn’t advertised. One of my friends said he signed up a few years ago and it was 2-3 instalments of $2,000 each. Looking at responses on some of the property positive forums price seems to range for $6,000 as a minimum but is more likely to be somewhere around the $10,000 mark. This $10,000 is a one time fee and pays for lifetime membership for you and your spouse. That being said – it is very easy to make a mistake in property investing that would cost you over $10,000 in losses so you could potentially make back your money with just one good deal. As far as I am aware there are no ongoing costs. I would assume that when you purchased a property they would expect you to go through their mortgage brokering service but I highly doubt that this would be a rule or enforced in any way. Chances are you will click on an ad or find an article and sign up for a free seminar that will be held in your local area. You will attend this seminar where there will probably be an opportunity to sign up to join their mentorship program or to attend another event where you can meet more people who are already members and potentially sign up there. The seminar will be worth attending, almost all of them are. You still get great information which can be very helpful in your investing career. But just be aware that there is going to be a sales pitch at the end. Consider it seriously, but don’t be drawn in by the hype. You will then likely to ‘advised’ towards a new build property that Positive Real Estate recommends for one reason or another. Just know that the bulk of the money is likely made through the sale of these properties to you, thus they have an monetary incentive to recommend particular properties potentially biasing the advise they give. Who Would This Service Be Suitable For? It is probably not for people just dabbling in real estate, because if you aren’t committed it is unlikely you will get the return on investment you need to justify the high price point. Are There Any Bad Experiences with Positive Property Real Estate and is it a Scam? Firstly, it’s not a scam. It’s a legitimate company that operates in both Australia and New Zealand. So you can put your scam troubles aside…they aren’t going to take your money and run. They are one of the biggest real estate mentorship companies in the country and they didn’t get that way by scamming people. I’m going to link below to relevant forum threads discussing Positive Property Real estate. Be careful of people posting in forums who have only written one post (and that post is a glowing review). This is a tactic some people use to make a product or service seem more legit. Whether or not Positive Real Estate is a great company is up to you to decide. My final word of advice is that before signing up find out (in detail) about your mentor and their property success and portfolio. Within a company there are always people who are great at what they do and people who aren’t so great. If the mentor won’t show you what he has done (or only shows you the successes and not the mistakes) that should be a big red flag. If that happens seek out another mentor in Positive Real Estate or elsewhere. They don’t have to be in your local area to be your mentor, especially when you are investing all over Australia.